For this finale, it's time to check out what happened during Kingdom Hearts 2 and Dream Drop Distance! 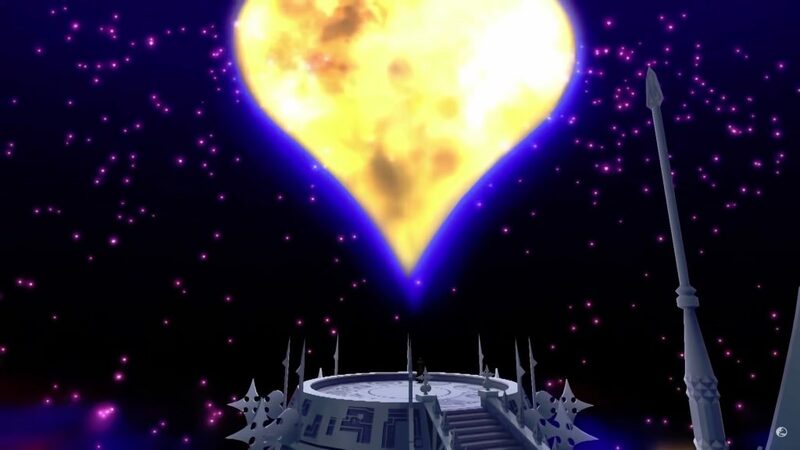 This is Part 3 aka the finale of our recap of the story of Kingdom Hearts! For those of you who didn’t know, this is our way of trying to give everyone a primer / refresher on what’s gone down in the game’s lore so you can catch up when you play Kingdom Heart 3 (WHICH IS OUT TODAY)! 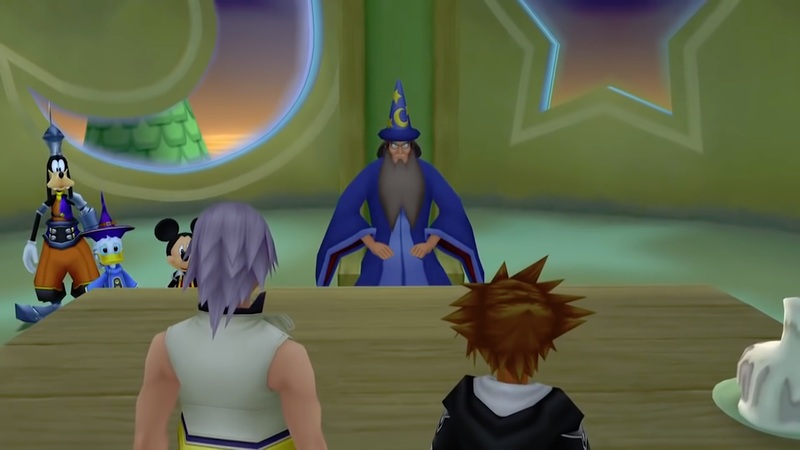 For this part, we’re covering the events of KINGDOM HEARTS 2 and DREAM DROP DISTANCE! All caught up? Then let’s finish this! What seems like an ordinary summer vacation turns into Axel finding out where Roxas is. 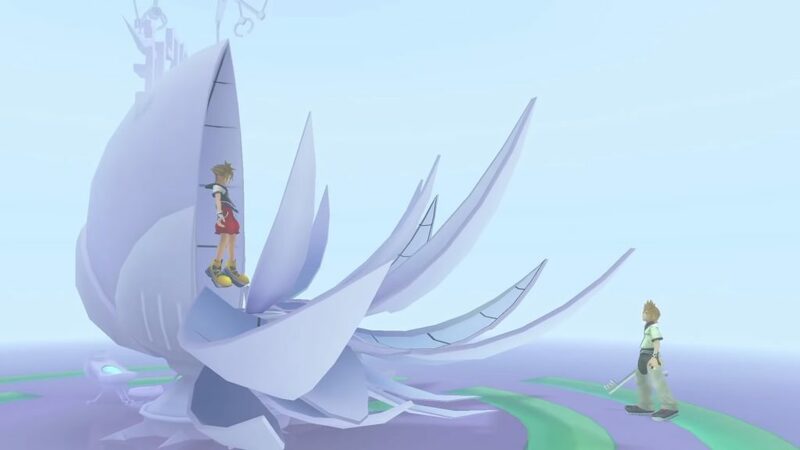 During his time in Twilight Town, Roxas has been struggling with disturbing dreams, which are actually Sora’s memories being processed elsewhere. Axel challenges Roxas, where he realizes he is a keyblade wielder, in an attempt to bring him back to the organization. Axel fails and goes back empty handed due to Diz’s interference. Suddenly, Roxas is able to connect with both Namine and Kairi telepathically and is able to speak to them despite not knowing who they are or their whereabouts. Namine fills him in, assuring him he will eventually meet Sora, and that Roxas is in fact a nobody. Axel then comes back a second time to retrieve Roxas, but is stopped by Diz once again. Diz and Roxas meet at the old mansion where he is introduced to Namine in person. Diz takes her away, but before they disappear she promises Roxas that they will meet again even if they don’t recognize each other. At this point Axel is both persistent and frustrated, challenging Roxas to a fight one more time. Regaining his own memories and abilities, Roxas defeats him. After the fight, he finally sees the sleeping pods where Sora, Donald, and Goofy are being kept. Greeted by Diz once more, Roxas is given a monologue pertaining to his own existence which pisses him off, and he tries to fight Diz. One pod opens and Roxas finally rejoins with Sora. Sora wakes up only seeing Donald and Goofy. When the three meet Yen Sid, they are briefed about the heartless, the nobodies, and that Maleficent is controlling the heartless now. On Destiny Island, Axel tries to kidnap Kairi, but Riku stops this from happening transporting her to Twilight Town. This does nothing because Axel finds her there anyways and kidnaps her to bring her back to the organization. Meanwhile in Hollow Bastion, Sora is reunited with his friends from Traverse Town – Squall, Yuffie, Cid, Aerith and Merlin. They have assembled together to create the Radiant Garden Restoration Committee to bring the world back to it’s former state. 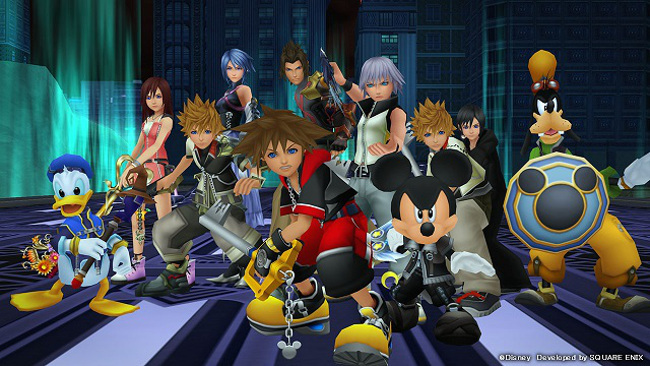 Sora, Donald, and Goofy join them. Our heroes go into Ansem’s lab looking for clues on his heartless and nobody research, but discover that Hollow Bastion is already under attack by a massive army of heartless. Xemnas and King Mickey fight and eventually disappear into a dark portal, leaving the heartless for our heroes to deal with. The big plan here is that Organization XIII are looking to use Sora’s keyblade to unlock the hearts of all these heartless in an attempt to unlock kingdom hearts once again. Maleficent shows up and it’s a battle between the heartless and the organization’s nobodies, which the fight is in inevitably won by the organization. Sora makes a quick escape thanks to Maleficent by sending him to the Realm of Darkness. After continuing his quest, Sora finds his way back to Twilight Town and meets with King Mickey. They find Diz’s old computer and enter a simulation. It’s in this simulation where they fight more nobodies and Axel sacrifices himself to save them, telling them where Kairi is being kept. As he disappears, he opens a portal to “The world that never was”, Organization XIII’s hideout. Within Sora’s very heart he is in conflict with Roxas, they battle and Sora wins. Back in the real world, our heroes make their way through “the castle that never was” and inside Kairi is freed by Namine. The two are confronted by Siax, another organization member, but are saved by Riku in heartless form. At the top of the castle, Sora reunites with Riku and Kairi and they fight Organization XIII together, taking down a few of their members. Riku fills Sora in on who Roxas is to him, and Real Ansem uses a machine to try and close kingdom hearts before more heartless flood into the world. The machine overloads upon Xemnas’ arrival and Ansem disappears. The blast of the machine overloading actually damages kingdom hearts. Our heroes fight Xemnas in his many forms and eventually win, and everyone leaves through a corridor of darkness. Namine and Roxas say their goodbyes to Kairi and Sora before merging hearts with them. After a final fight with Xemnas in his last form, Riku and Sora are transferred to a dark beach while Kairi goes to Destiny Island. It is on the dark beach where Riku and Sora see a door of light and walk through it reuniting with Kairi and King Mickey. Everyone meets with Jimney Cricket who has been documenting Sora’s journey thus far, only to find one of his journals completely blank save for the words, “Thank Namine.” This was written knowing he was going to lose his memories of her. Also in the journal there is a passage making reference to a group called ‘the hurting’, which refers to the seven characters they were unable to save. 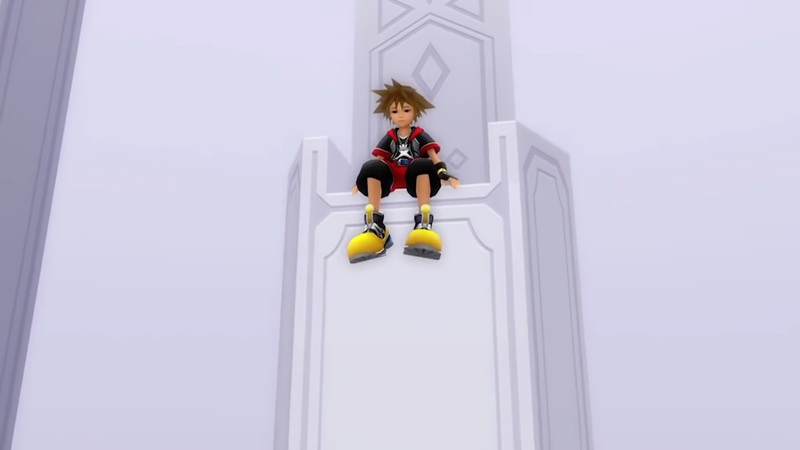 King Mickey digitizes Sora into a data version of Destiny Island to find out more about ‘the hurting.’ Sora eventually meets with Roxas, but doesn’t remember much about him. Namine is there and fills Sora in on who all seven of these characters are: Axel, Xion, Aqua, Terra, Ventas, and herself. King Mickey discusses the prospect of finding Aqua, Terra, and Ventas. They are aware of both Aqua and Ventas’ whereabouts, but conclude that they should be looking for Terra. Yen Sid discloses that there his a high potential of the resurrection of Xehanort, and they need another keyblade master in order to stand a chance against him. This means that the next two people to undergo the Keyblade Master’s exam will be Sora and Riku. In the Realm of Darkness, Aqua meets with Real Ansem. He tells her about meeting Sora a year ago, and that he hid his research inside Sora in hopes that it will be useful when the time was right. Organization XIII are then revived back to their human forms and Axel takes on the name Lea. The exam starts with the objective to go back to seven worlds to unlock their keyholes and awaken them to reconnect them to other worlds. This action will grant them enough power to stand a chance against Xehanort’s return and for them to become keyblade masters. Being sent back in time, Sora is sent into the dreams of the worlds, while Riku accidentally stumbles into Sora’s dreams instead. While this is going on, King Mickey finds out Maleficent has kidnapped Queen Minnie, and sets out to go save her. Lea appears at Disney castle, but Maleficent still gets away. Once back at Yen Sid’s tower, Lea demands that he gets a keyblade, which prompts him to start his training. In the dream world, Sora and Roxas find Xehanort’s heartless and nobody selves as well as a mysterious young man. After sealing all the keyholes, Sora returns to the real world and is transported to “the world that never was”. Once there, he finds out that all the human forms, minus Lea, of Organization XIII have gone back to their nobody forms. The mysterious man puts Sora to sleep, and it is discovered that he is a young Xehanort able to travel through time. The original intent planted in young Xehanort’s mind by heartless Ansem back in Birth by Sleep is now being hatched. He is gathering 13 versions of himself, aka vessles, that will contain his fragmented heart. This will revive the X-Blade and open kingdom hearts again. Sora dives deeper into his dreams, being haunted by ‘the hurting’ along the way as he learns Xehanort’s plan. Turns out, from his initial meeting with heartless Ansem to now, his plan has failed many times over especially with individuals like Axel, Xion, and Roxas kind of doing their own thing. Zigbar, Briag’s nobody, tries to recruit Sora into Organization XIII but he refuses. The whole gang is there now to fight and they win, but in the process Sora’s heart becomes damaged and he succumbs to the darkness in him. His saviour is Ventus, offering his keyblade war armour. Riki is stuck in Sora’s dreams, also landing in ‘the world that never was’. He finds an unconscious Sora after Xehanort put him to sleep, making it possible for him to find him. 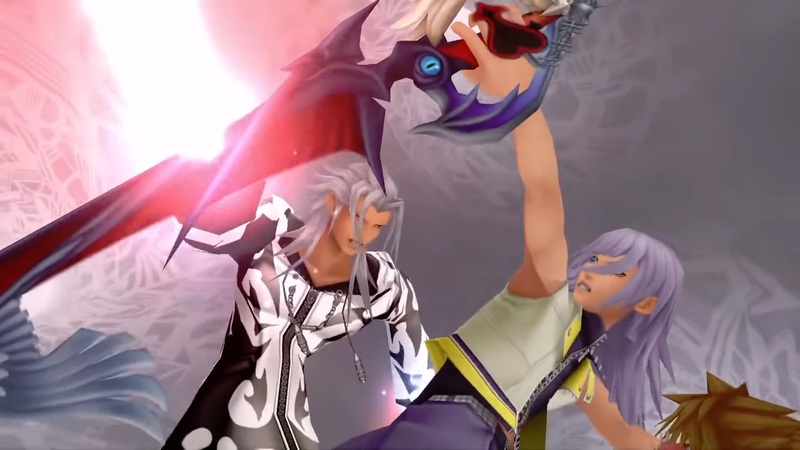 Riku fights a shadow figure only to be dragged into the darkness and greeted by Xehanort’s heartless self and is told that he was actually a dream eater this whole time during the exam. Wanting to take over Riku once more, Xehanort challenges him. His heart resists the darkness now after having memories of meeting with Terra as a kid. Riku embraces the light and his keyblade appears, and upon defeating him he is brought back to the real world. He finds himself in the throne room and greeted by young Xehanort and a sleeping Sora. He is in preparations in making Sora a 13th vessel. Around the room all of Xehanort’s versions sit staring down at them, one being the original Master Xehanort. King Mickey shows up to fight young Xehanort, but Riku fights him instead. When Riku wins, Master Xehanort discloses his plan to revive the X-Blade and to start another keyblade war. He also tries to put a fragment of his heart into sleeping Sora, but is stopped in time by Lea who takes the hit instead. After another battle, Master Xehanort disappears once again, so Riku and King Mickey return to Yen Sid to fill him in on what happened. Riku then needs to go into Sora’s dreams again to wake him up. When he finds him, he’s wearing Ventus’ armour that has been corrupted by the heartless. 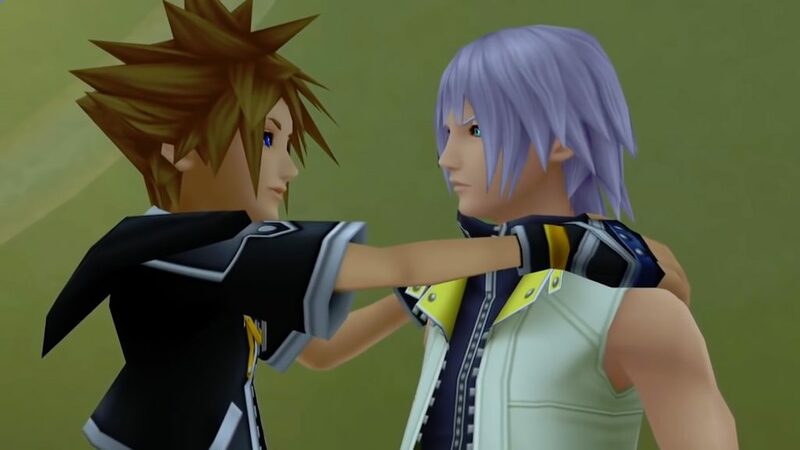 They fight, Riku wins, Sora vanishes. 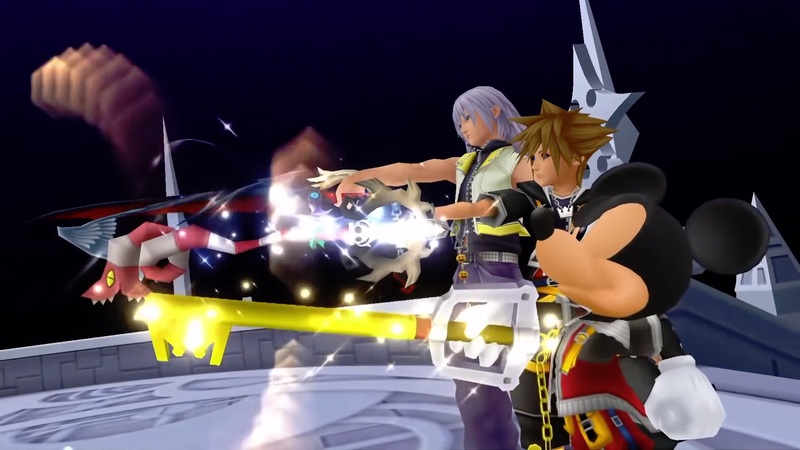 Riku uses Sora’s keyblade to go back to Destiny Island where he meets Aqua, Ventas, Terra and the real Ansem. This part is a section of Sora where Ansem hid his research. Riku is told that Sora woke up, and it’s time to go back to the real world. It is there where Yen Sid congratulates Riku on becoming a keyblade master and that Sora failed because he succumbed to the darkness. Lea shows up and he is the next pupil to take the exam. Later, Yen Sid and Mickey discuss the keyblade war and decide they need another protector for seven princesses, and it turns out to be Kairi who starts her training to do so. Also taking into consideration that they still need to save Ventas, Aqua, and Terra – Terra being the most crucial because they, again, know the location of the other two. Lastly, Sora is told by Yen Sid that in succumbing to the darkness while in Ventas’ corrupted armour, he lost a lot of his abilities so he must meet with another hero who had the same thing happen to him…in Olympus Coliseum. This is where Kingdom Hearts III will begin. THERE IT IS! You’re all caught up! 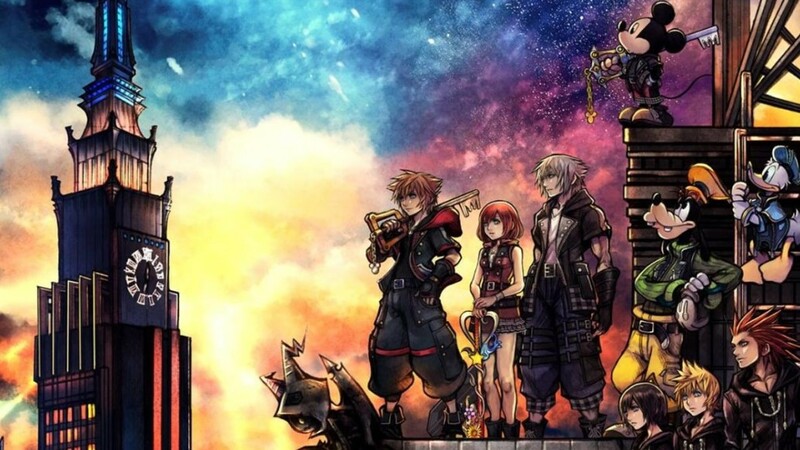 We’re done with our recap and it’s time for Kingdom Hearts 3 to continue the story! Thank you for sticking by and keeping up with this recap series! We hope you have a blast playing Kingdom Hearts III! Wanna find out how Kingdom Hearts 3 is? You can also check out our review HERE!